On Tuesday 17th October, at St James’ Church, Hampton Hill, SPEAR will host a screening of Daisy May Hudson’s acclaimed documentary, Half Way. Daisy was a panelist and speaker at SPEAR‘s recent, highly successful 30th Anniversary event, at which the trailer for Half Way was met with much admiration and interest. 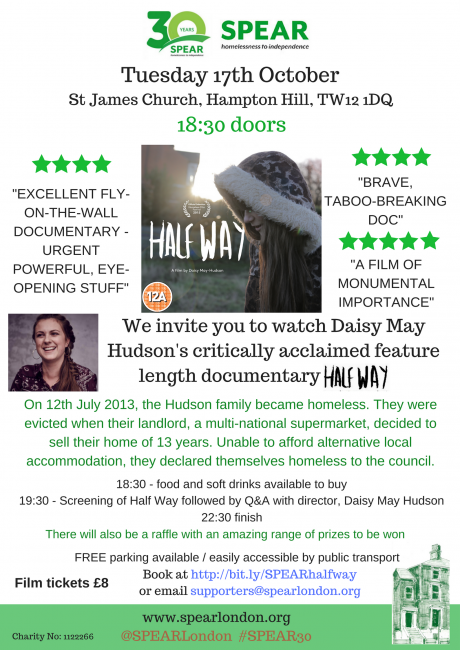 Daisy, herself, will join us at the event for a director’s Q&A after the screening, chaired by film maker, Morag Livingstone. Admission for this screening will be just £8. There will be complimentary Ben & Jerry’s ice creams for guests plus soft drinks and hot food available to buy. There is free parking available and the church is well served by buses: R68 (from Richmond via Strawberry Hill), R70 (from Richmond), 285 (from Kingston) all stop at Parkside bus stop close to TESCO Metro, Hampton Hill. There will also be a fundraising raffle with some incredibly covetable film-related prizes on offer, such as tickets for screenings at the BFI, a family ticket for London Film Museum and lunch for 2 at ‘The Lounge‘ private members club at Twickenham Studios. 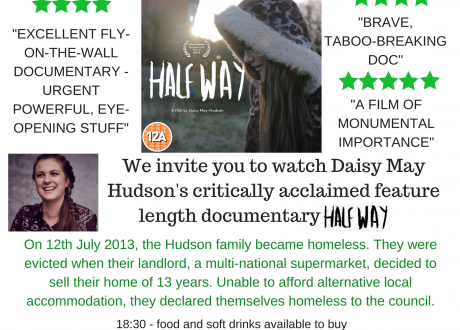 Daisy May Hudson’s first feature length documentary ‘Half Way’, received widespread critical acclaim when it was released in 2015. ‘Half Way’ was shot during the time Daisy and her family were living in a homeless hostel over a year during 2013. 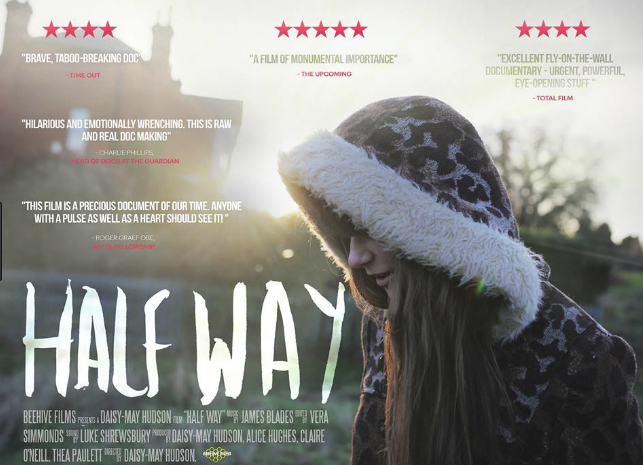 She successfully raised £10,000 on crowd-funding website Indiegogo, which she used to turn 250 hours of raw footage into the insightful, deeply moving and , at times, heartwarmingly humorous, ‘Half Way’. Daisy is now a journalist at VICE and recently had her own series commissioned called Superhuman, the first episode of which, Iceman, was released earlier this year. Daisy-May has written for publications including The Times, Independent, The Debrief and VICE, and is currently writing a feature-length screenplay. She appeared on Newsnight earlier this year , speaking to Emily Maitlis about homelessness and her experience of it. Daisy was recently awarded a BRITDOCS Fellowship. What will you do with your first new £10?